I finally received your letter of February 25, which made us very happy in spite of its melancholy content. Gisuschka, how can someone who is so young and beautiful and has her whole life ahead of her have such a melancholy outlook? I was always cheerful, although my youth was not so wonderful. I had no worries, in spite of the fact that I often went to bed with an empty stomach. Not even today, in my sad situation, when I don’t even know where I will eventually lay my tired head, am I as sad as you. I put my trust in God, and that is what you, my beloved child, should do. I hold fast to the hope that all of us who love each other so much will see each other in the not too distant future and will never part again. Then you will have your devoted mother with you again. Your pious mother could not have loved you more than I love you three. I have always been sad that our dear God denied me the blessing of children, but that was wise, because if I had my own child, I could not be so intensely involved with you. Of course, I like my golden Trudel1 very, very much; after all, isn’t she my blood relative, but she can’t understand my feelings yet. Unfortunately, she is at present so extremely far away from me and it is doubtful that I will see her again. Dear Giserl, I beg you, make me happy and don’t be so melancholy. It really doesn’t make sense, as you have the support of a big family who loves you, and your good “Papschi” adores you and speaks of you with great enthusiasm. I have asked you repeatedly whether Mrs. Feldstein delivered the many things that Aunt Anny and I gave her for you. The wonderful blue cloth coat was an especially precious piece, and I had the real collar made for it just last year. Please write me about it and take care of it. I will be able to send you many things with Irma Hauser from Hollabrunn. Her name is Mrs. Kohn, and she used to live in St. Pölten. She has gotten a “Capitalist Certificate” through Uncle Karl, and will come down there [to Palestine] soon. She is taking a lift2 with her, and I’ll be able to add several things to that. Perhaps even some featherbeds. At this time, I can’t send you anything from here, my dear child, since a strict warning was issued that Jews are not allowed to send packages, not even 50 decagrams. One must report to the foreign exchange office and stand there for hours, but I have the opportunity to send it all to Papa in Brünn, and he’ll send you everything, including the money. I’ll start the black sweater next week, and besides that, I’ll send you a charming knitted silk blouse like those that I am making for Bertherl and my beloved Putzerl3 for Easter. One is light green and the other strawberry red, and yours a lovely light blue. Else Sulzer made one for a customer and tried it on Putzi when she was here for Christmas. It fit her so beautifully that Else had to buy the beautiful silk yarn for me right away, and I am working feverishly so that it will be finished by Easter when Bertherl comes with Mrs. Spitz. A dirndl4 will be sent by Papschi. Write me all your wishes. You were always too modest, which cannot be said of Bertuschka.5 Papa has been very angry with her lately; she is so unruly and keeps very bad company. We should have received the telegram from Uncle Karl today, telling of his happy arrival in New York, but we are still waiting impatiently. They spent almost 14 days in Rotterdam, and enjoyed lovely days with a fraternity brother. Karl has good friends everywhere, and I hope that he will also get along well in America. Uncle Max is said to be on his way to Palestine as an illegal single traveler.7 We have had no news from him in six weeks, and are very worried. Aunt Stella left four weeks ago on an illegal transport. Unfortunately, they got only as far as Konstanza, and could not go any farther. Uncle Sigl8 said that four of those transports could not land; that is a great disaster for us Jews!!! I am sending you several pictures, including one of your good grandfather. 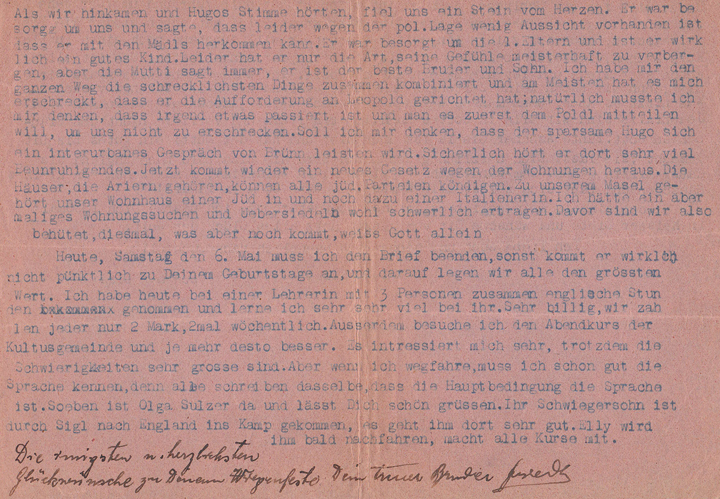 Your Papa wrote us that when he has to punish Berta, she says that she will tattle to Grandpapa in Vienna right away. She loves Grandpapa above all others. My Putzi loves Uncle Poldi above all others, but naturally, I am in first place. The Schuberts are still here and send regards and would be very happy if you wrote to them. The address is 6 Münzwardeingasse 8, II St. Both of the Tiefenbrunns’ children are in England, in Glasgow. Mr. And Mrs. Tiefenbrunn are currently very angry with us because that liar, Lia, spread terrible gossip about us. If they believe such a liar, I am not apologizing at all. At the moment, I have so much to do anyway that I have no time for socializing. I also rarely go to the Schuberts. Mrs. Koblitz invited me several times, but I have no time to go there. I use all my free time to knit and to deal with my very extensive correspondence. I intend to start learning English and want to attend a career reeducation course. After all, I do have to think of myself. Mutti has been very ill for almost four weeks. She caught the flu from Aunt Stella who stayed with us for two weeks before her departure. Then she also got a bladder infection, had no appetite and could not sleep. Naturally, she was very grumpy, making my life difficult. Now she is very lively again, and interested in everything. She worries a lot about you and your sisters. When Annerl was here for Christmas, there were big jealousy scenes, as grandmother never wanted to let Anny go to Tiefenbrunns, and Hansl wanted her only for himself. Now he wrote to her that she can only come to England when a family there will sponsor her. That can take a long time, and the poor child must remain with that family where she has to work so hard. The poor child is looking very unkempt due to all the rough work. I am upset as I would like so much to help all my dear children, and cannot. When we got here and heard Hugo’s voice, a stone dropped from our hearts. He was worried about us and said that due to the political situation there is, unfortunately, little chance that he can come here with the girls. He is worried about the dear parents, as he is really a good child. Unfortunately, he has a way of hiding his feelings, but Mutti always says that he is the best brother and son. The whole way here, I thought of the most terrible things, and what frightened me most was that he directed the invitation to Leopold. Of course, I thought that something had happened and he had to tell it to Poldl first, so as not to frighten us. I thought that thrifty Hugo would not treat himself to a long distance call from Brünn [without a good reason]. Surely, he hears a lot of disquieting news there. Another new law regarding apartments was promulgated recently. Aryans who own homes can cancel the leases of all Jewish parties. Fortunately, our apartment house belongs to a Jewish lady, an Italian, at that. Searching for an apartment and moving would be very hard on me. We are spared that, at least this time, but only God knows what will happen next. Today, Saturday, May 6, I must close this letter, otherwise it will really not reach you in time for your birthday, which is very important to all of us. Today, I and three other people attended an English class with a teacher, and I am learning a lot from her. It is very inexpensive; we each pay only two Marks twice a week. Apart from that, I attend the evening course of the Jewish Community (“Kultusgemiende”); the more the better. I am very interested despite the difficulties. When I do go away, I must know the language well, as everybody writes that the language is most essential. Right now, Olga Sulzer is here, and sends regards. Sigl was instrumental in getting her son-in-law into a camp in England. He is doing very well there. Elly will follow him soon; she is taking all the courses. Deepest and heartfelt wishes for good luck on your birthday. I am now hurrying to close. It is already 6:30 and at 7, I will be going to the English course. I take it very seriously. Although Poldl has lost his enthusiasm, I am forcing him to continue his studies. He definitely wants to take a butler course. Perhaps we can get a [servant] position as a married couple. We are all very miserable, and the situation is not very rosy. You probably know more than we do here, as we have no newspaper and it is strictly forbidden to listen to foreign broadcasts. What good would it do us in any case? We know that no human can know what will happen; we are all in God’s hand. I am religious and do not lose my belief in God. Aunt Gisela Aschner is here too and she made Mutti a good, simple cake. She sends warm regards to you. Elsa will soon be going to England as a household helper. Xandl is doing wonderfully in Palestine. He already has a small house and grows all sorts of vegetables. That would be my ideal!! Once again, my beloved golden heart-sister, I hug you a thousand times in ardent love and wholeheartedly wish you all the luck in the world. I love you and endlessly long for all of you. 1. Trude Nadel, infant daughter of Gisela’s younger sister, Anna Jellinek Nadel. 2. A very large shipping container. 3. Putzerl and Putzi were affectionate nicknames for Anna, Hugo Jellinek’s youngest daughter and Nadja’s youngest sister; Bertherl was one of several affectionate nicknames for Berta, Hugo’s middle daughter. 5. Bertuschka was an affectionate Russianized nickname for Berta, Hugo’s middle daughter/Nadja’s younger sister. 7. Gisela is mistaken about Max Jellinek’s destination. Max escaped to Shanghai, China in January 1939. 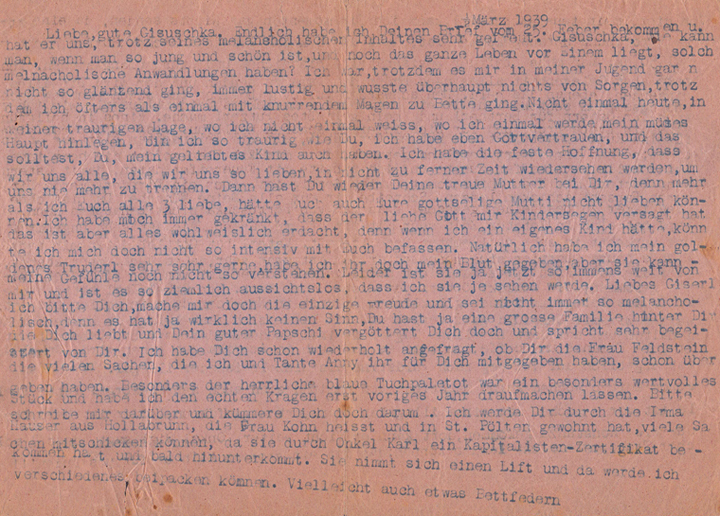 Max's letter to his brother, Karl, dated "Shanghai, May 16, 1939", can be read now on this website. 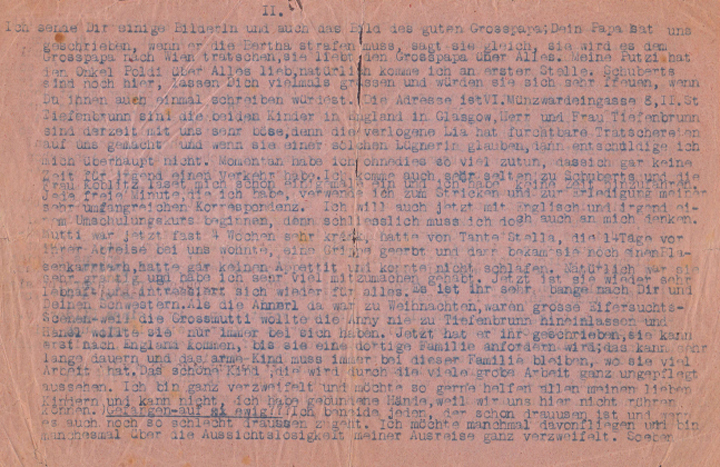 Max's letter from Shanghai of April 23, 1939, and two photos of Max in Shanghai will be shown on this website in the future. 8. Affectionate nickname for Siegfried Jellinek, who was Gisela’s brother and Gisella Nadja’s uncle. 9. Willy Jellinek, Oscar Jellinek’s son, was imprisoned at the Dachau concentration camp at this time. 10. Underlined type added by P. Jellinek, to make sure that readers notice these particularly powerful, poignant words. 11. 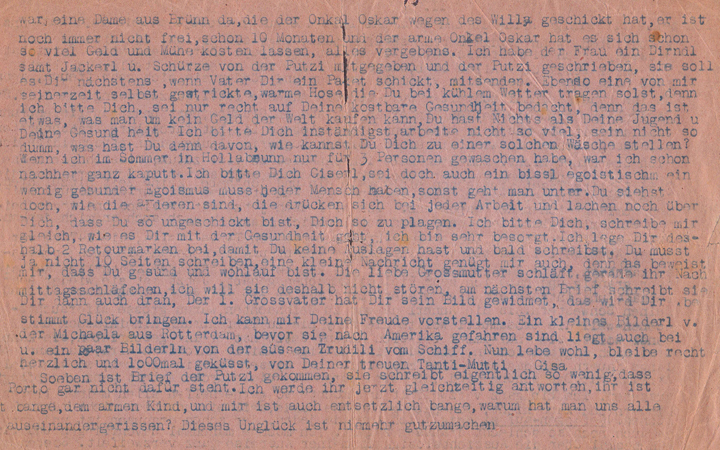 “Friedel” was commonly used as a nickname for “Siegfried” or “Friedbert.” Siegfried Jellinek, Gisela’s brother/Gisella Nadja’s uncle, who was still in Vienna at this time, added this note to Gisela’s letter. 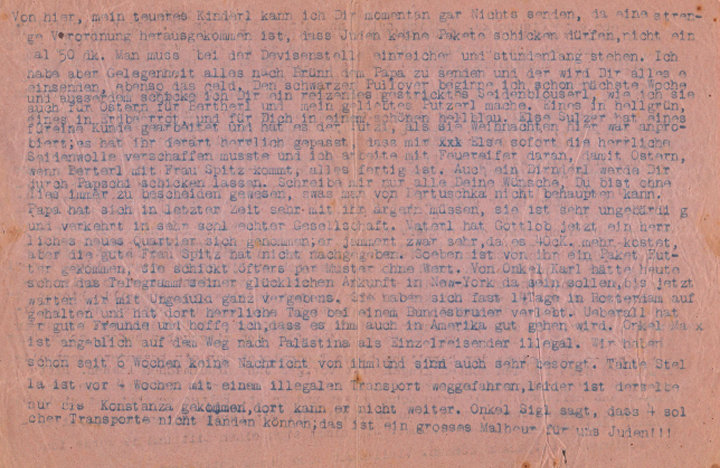 “Your faithful brother” signified a closeness of spirit, probably regarding Siegfried and Gisella Nadja’s shared strong feelings for Zionism, and possibly also for the specific ideology of the Betar movement.